Proper nutrition can add years to your horse’s life. Diet is the foundation for raising a healthy, happy horse. 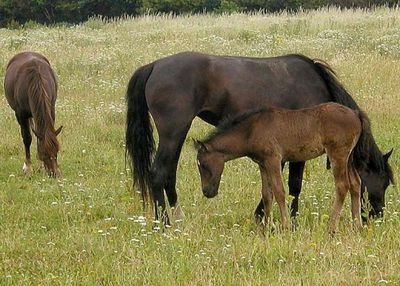 Horses are herbivores, eating only vegetation. They are grazing animals and can and do forage for most of their waking hours. They are slow feeds and spend their time chewing grasses and other plants. Fiber is the main ingredient of a horse’s diet. If there is not enough pasture for grazing, supplement with lots of high quality hay. If your horse spends a lot of time in the barn in his/her stall, make sure fresh hay is always available. Feed grains such as bran, corn, and oats in small amounts several times a day. 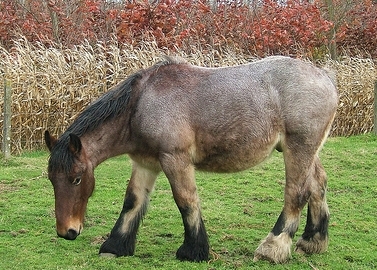 Small feedings allow the horse to better digest its food. Grains should be a much smaller part of the horse’s diet compared to hay consumed. Salt blocks should always be available. They contain salt, iodine, zinc, iron, manganese, copper and cobalt. The addition of a calcium and phosphorous block ensures that your horse’s diet contain all necessary nutrients. Each horse is an individual and has different dietary requirements. For example, working horses need larger amounts of food than non-workers. Find out what the ideal weight is for your particular horse. Ask your veterinarian, who will have a large enough scale to weigh him/her. If your horse is too thin, add more hay or high fiber beet pulp, hay cubes. 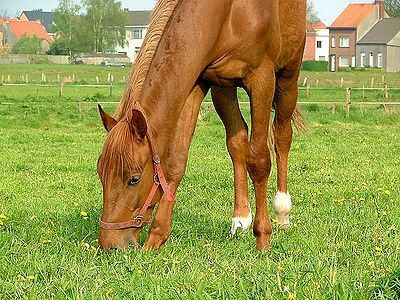 If your horse is too heavy, try decreasing pasture a bit, decrease grain mixes and increase exercise. Check with your vet before making any changes. If you are unsure about supplements and amounts to feed, if your horse is overweight or underweight, if your horse is a youngster or a senior or inbetween, working or not, consult your veterinarian and/or a horse nutritionist. They will help you choose the proper diet to keep your horse fit and healthy.